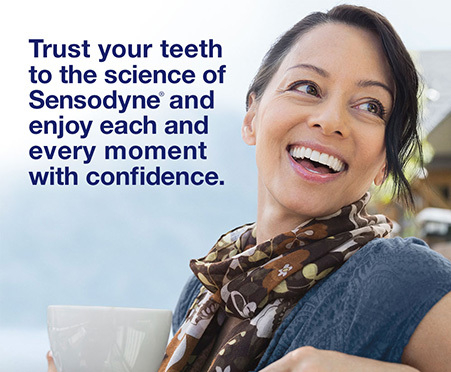 Sensodyne® is the #1 dentist recommended brand for sensitive teeth. Painful teeth. Standard Sensodyne is a very good product, but this product produces pain in my teeth and gums. I can isolate the problem to this toothpaste. 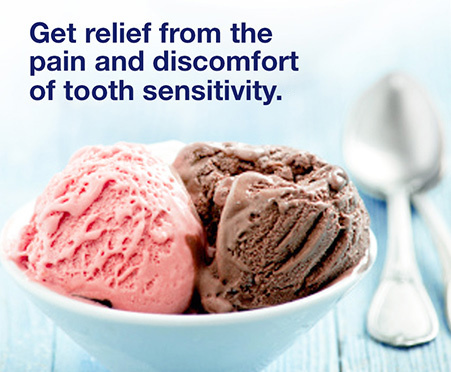 I wouldn't recommend it if you have any type of tooth or soft tissue sensitivities. Want to reiterate that their core product - regular sensitivity toothpaste - is good, and I do recommend it. I would recommend the Deep Clean version. I have tried 3 other versions of the Sensodyne product line. They all worked, but lately I have settled on the "Deep Clean" version. Seems to be working just fine. Not sure what the difference is between the 24/7 and the Deep Clean. I was using the 24/7 but switched to the Deep Clean when it was introduced. Mostly to match up with my Listerine Deep clean mouthwash. Painful!. My teeth and gums are overly sensitive so I was advised only to brush at night before bed. So I've used the original sensodyne sense I was young. But I decided to change it up.. After about 2 days of using it I noticed the first night I had a Sore throat, but I passed it off as reflux and moved on. So the 3rd night I brushed and I went to bed. In the middle of the night I woke up to a sharp pain in my mouth. I got up and I looked inside of my mouth, my cheeks where extremely red and swollen, which caused me to bite the very back of my cheek in my sleep. I rushed to the doctor sense a dentist couldn't see me for weeks. Due to the swelling they thought it was due to wisdom teeth. So they gave me antibiotics and was told not to brush my teeth and just do regular salt wash. I did that For 2 days before taking the antibiotics. Then I realized sense not using the toothpaste my sore throat, inflammation & mouth pain where gone (other then then the huge hole where I bit it). So I stopped use completely. A few days later a accidentally grabbed the wrong tooth paste and used this one. Sure enough it happened again and I managed to bite my already injured cheek again. So now 3 weeks later, I am still healing a severely bitten cheek that I've accidently rebitten at least 5 times and now have to wear a night guard all day due to the bites location. I've thrown it away and will never go near it again. I'll just stick to the original or another brand. For squeaky clean teeth and fresh breath this is for you!. I've been a dental hygienist for 6 years now. Over the years my teeth have become more sensitive but I didn't want to give up that really clean feeling you get with regular toothpaste. Our sensodyne rep gave us some samples of the Deep Clean and I was hooked right away. It delivers the sensitivity ingredients I need but leaves my teeth feeling extra clean! 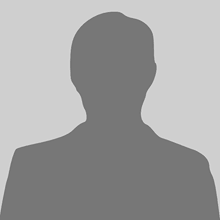 I recommend this to all my patients who are unsure about making the switch! Does exactly what it says! Great!. I had several teeth pulled at one time. The dentist gave me a sample of Sensodyne toothpaste. It not only relieved the sensitivity of the surrounding teeth but, a lot of the gum pain where the teeth were pulled. I was very grateful that the dentist gave me the sample. I am going to use Sensodyne toothpaste from now on. Thanks! It works. I tried changing and the sensitivity returned!. Took away the pain cold drimks! I love ice and it doesn't even hurt to munch on it anymore. Great Product. I really like this toothpaste!! It made my teeth so clean and breathe fresh. Liked it!. Ive been using this product for about a month in addition to flossing and mouthwash use. It makes my teeth feel very clean. It has a refreshing taste. When you finish you just have to rinse out your mouth a few times with water so you dont have that tissue film afterwards. I like it, the real test will be when I go back to the dentist and am cavity free. Life saver!. My dentist recommended Sensodyne. It has relieved my tooth sensitivity 100% with regular use! What a life saver from tooth pain! I will keep buying this. I use to have my entire mouth numbed with Novocain to get my teeth cleaned, I no longer need to do this since using sensodyne toothpaste! no. 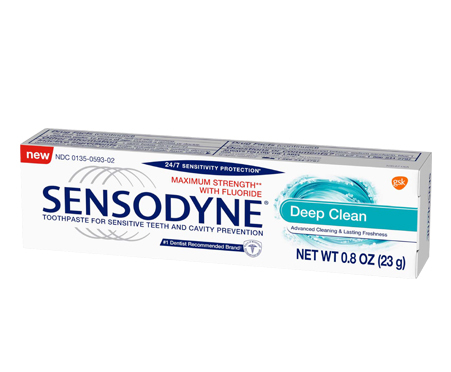 Used Sensodyne for many years, however, after two weeks on the deep clean, I was having severe pain and sensitivity. Much better now that I am using the fresh impact. Sensodyne toothpaste. It relief pain of sore gum, and a healthy smile. Only toothpaste I buy !!!!. 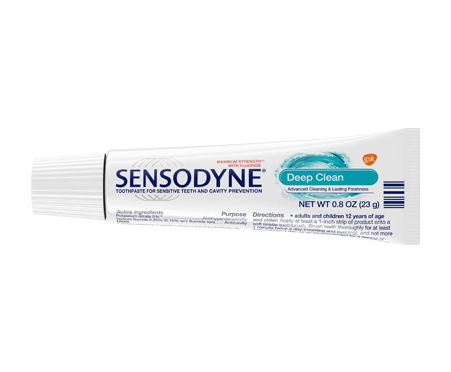 I've been using sensodyne for several years now and would never switch or use another sensitivy toothpaste.truly all day protection from pain from cold drinks. Just recently tried this one and liked it just as much as the other varieties. Don't waste your money on another toothpaste. Great but maybe not for everyone. Does the sensitivity job as described but you need to use it for several weeks to get the benefit which only makes sense since it's actually doing a repair job. Tastes fine, etc. My problem with it is that it makes the lining of my mouth shed superficial tissue. This isn't a problem for most people. I've read that this can be due primarily when laurel sulfate is an ingredient although a few others can bother also. I cannot find a full ingredient list to confirm this, but I suspect I'll have to give this fine product a quick toss toward the trash can. It works fine for my husband. Sensodyne. I love sensodyne new toothpaste. It makes my teeth and mouth feel fresh and it deep cleans. I love the foaming because it makes me know I'm cleaning my teeth right. Not a product for me. The Sensodyne Deep Clean toothpaste did a good job at cleaning​ my teeth. Not seeing the benefits. I've been using SENSODYNE® DEEP CLEAN for a whole week now and nothing really changed to my sensitive teeth. I use it twice, morning and before bed. I do like the foaming; it's soft and nice. The flavor is alright. I never felt any deep clean as advertised nor see any benefits that regular toothpaste cannot provide. Clean Teeth. I found Sensodyne Deep Clean to be rather pleasant to use. The taste was great and I hadn't a nice clean mouth. I do suffer from hot and cold sensitivity and felt that it helped me tolerate food items better. Pretty neat how've a toothpaste can't do that. I received this product complimentary for reviewing purposes. Great product. Husband has issues with sensitive teeth and using Sensodyne Deep Clean helped so much! He enjoyed the cooling feel and great taste. We're already continue to purchase more Sensodynefrom now on. Instant relief. Sensodyne deep clean actually worked on my extremely sensitive teeth. Love it. Toothcleaner. I really liked the flavor. My teeth felt clean and refreshed. Sensodyne. I have enjoyed my free sample of Sensodyne Deep Clean. The product left my mouth fresh and clean feeling. Sensitivity has decreased since using Sensodyne.